Please read these terms and conditions carefully. By accessing this web site, you are indicating that you have read, acknowledge and agree to be bound by these Terms and Conditions. If you do not agree to these Terms and Conditions, do not use this web site. Nothing on this site should be construed as a solicitation to buy or sell any security or financial instrument or to participate in any particular trading strategy. Further, nothing on this site should be construed as rendering tax or legal advice. Cabrera Capital reserves the right to change these Terms and Conditions which you are responsible to review regularly. Your continued use of this web site constitutes agreement to all such changes. 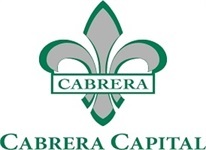 Unauthorized use of Cabrera Capital web site, including, but not limited to, unauthorized entry into Cabrera’s systems, misuse of passwords or misuse of any other information, is strictly prohibited. Cabrera Capital. reserves the right, in its sole discretion, without any obligation and without any notice requirement, to change, improve or correct the information, materials and descriptions on this web site and to suspend and/or deny access to this web site for scheduled or unscheduled maintenance, upgrades, improvements, or corrections. The information and materials on this web site may contain typographical errors or inaccuracies. Any date information is published as of its date only, and Cabrera Capital. does not undertake any obligation or responsibility to update or to amend any such information. Cabrera Capital. may discontinue or change any service described in or offered on this web site at any time. Except as expressly set forth in this Agreement, Cabrera Capital. and its directors, officers, employees, licensors and agents expressly disclaim all express and implied warranties, including without limitation warranties of merchantability, fitness for a particular purpose, and error-free and uninterrupted service. Cabrera Capital. will not be responsible for any loss or damage that could result from interception by third parties of ay information or services made available to you through this web site. Although the information provided to you on this web site is obtained and compiled from sources that we believe to be reliable, Cabrera Capital. cannot and does not guarantee the accuracy, validity, timeliness or completeness of any information or data made available to you for any particular purpose. As a result of high internet traffic, transmission problems, systems capacity, and other problems, you may at times, experience difficulty accessing this web site or communicating with Cabrera Capital. through the internet or other electronic and wireless services. Any computer system or other electronic device, whether it is yours, an internet service provider’s, or Cabrera Capital's, can experience unanticipated outages or slowdowns, or capacity limitations. All right, title and interest in this web site and any content contained herein is the exclusive property of Cabrera Capital, except as otherwise stated. Unless otherwise specified, this web site is for your personal and non-commercial use only and you may print, copy or download any information or portion of this web site for your personal use only. You may not modify, copy, distribute, transmit, display, perform, reproduce, publish, license, frame, create derivative works from, transfer, or otherwise use in any other way for commercial or public purposes in whole or in part any information, software, products or services obtained from this web site, except for the purposes expressly provided herein, without Cabrera Capital’s prior written approval. If you copy or download any information from this web site, you agree that you will not remove or obscure any copyright or other notices or legends contained in any such information. These Terms and Conditions shall be governed by and construed in accordance with the State of Illinois. Sole and exclusive jurisdiction for any action or proceeding arising out of or related to these Terms and Conditions shall be in an appropriate state or federal court located in the Count of Cook, State of Illinois and the parties unconditionally waive their respective rights to a jury trial. Any cause of action you may have with respect to your use of this web site must be commenced within one (1) year after the claim or cause of action arises.